Newly renovated… Wall to wall carpet in bedroom and livingroom, and tile in kitchen and bathroom. New windows throughout. Updated electric and plumbing. Off street parking in rear. Close to public transportation and walking distance to local shopping. Only 2 minutes from Main St. Manayunk. No laundry on premises, but laundry mat is only a half block away. All utilities are included with this apartment except electric, cable and phone. 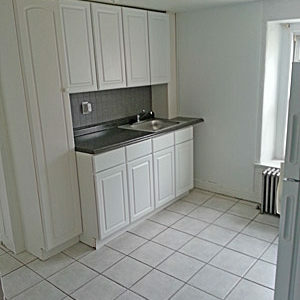 Apartment does come with refrigerator, stove and new cabinets in kitchen. Gas heat included! Total Sq. Ft.= 475 sq. ft.